Cancerous deer shot in Dimock PA. Lived near a stream where fracturing water had been said to be leaking. Is fracking really “safe” for us? As much as i love deer and deer hunting, That is one nasty lookin whitetail!!!! !I think the hunter did the deer a favor….. Pretty dificult to find a form for that mount I bet. That thing is groty to the max. That is unbelievable! I think I may have threw up a little though. 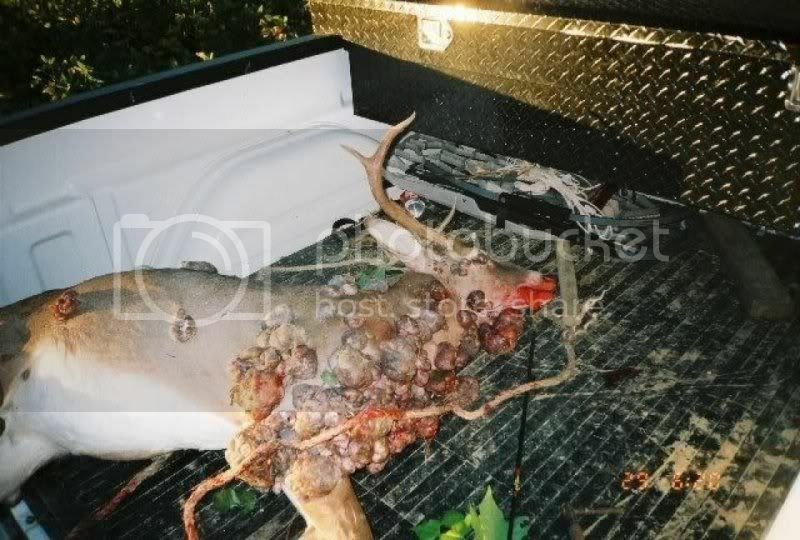 According to Mississippi Game Department, these are ‘fibromas’ that are commonly called deer warts by hunters. See excerpts below. good work danny! humans get that disease too. its still pretty ugly though. Just read all about this a couple weeks back, so decided to post to this. Gross looking, and I would have to say, I would not eat a deer if I killed one that had these, even though it is suppose to be safe. As much as I hate say that I wouldn’t eat this buck, I am very surprised that he grew such a decent rack with the health problems that he held. I would have shot him just to challenge my taxidermist! Good luck! !